This weekend, I went shopping. I needed to pick up a couple of things legitimately. Then I got a few more. One of my purchases are these super fun palazzo pants. I have several genie/harem pants, but none of these ultra wide leg trousers. 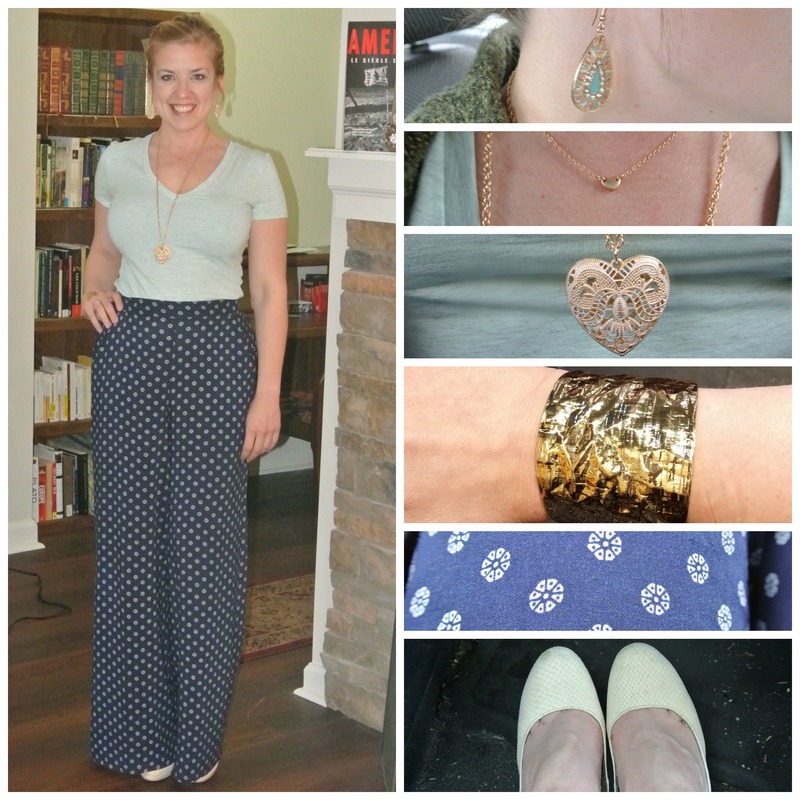 In anticipation of writing this post, I tried to figure out why they’re called palazzo pants. Apparently, no one on the internet knows, as I spent a good 4 minutes searching and came up with nothing. However, I did discover that palazzo means palace in Italian. So, I’m going to assume that these pants were commonly worn among the Italian royal set, and they have since remained a symbol of casual luxury. Seems as good an explanation as any, right? Anyway, I got these on clearance at Target for $14. You can find them here (although not on clearance). We’ve talked about the Target Cartwheel app before (refresher here), and I definitely used that for 50% off some Easter candy. But, Target was also doing a promotion where you could text for a $5 off $25 apparel/shoes/accessories coupon. So, that happened. I love these pants for many reasons. 1) I basically feel like I’m wearing pajamas. Super soft, comfortable pajamas. 2) They are SO flattering! I haven’t observed enough people in them to know if they are universally flattering, but my guess would be yes. 3) They make me look tall. Few things make me look tall – I am not tall. But to get these off the floor, I have to wear fairly high heels, which are still mostly covered by the pants, thus giving the illusion of height. Don’t mind the dirty floor in the shoe pictures. I’d forgotten to take one and took it in my car. Obviously, I don’t vacuum my car as often as I should. #nojudgment. Have you tried palazzo pants yet? It actually is a season or two old, so I’m a little late to the party, but I hope it lasts a long time. What do you think of the look?